In my laundry room, I have a door with a window. I love the light shining in our house, but this room needed a bit of shade. I store some of our food in here and the light/heat could cause discoloring or damage to the foods we have prepared. So, I needed to fix that. Being that I didn't want to spend any money on the project, I went rummaging through my fabric box and found a bit of yardage for the print above. Most of my house is painted yellow on the inside. I adore yellow. It is homey and warm and just lovely. Also, I love my chickens. 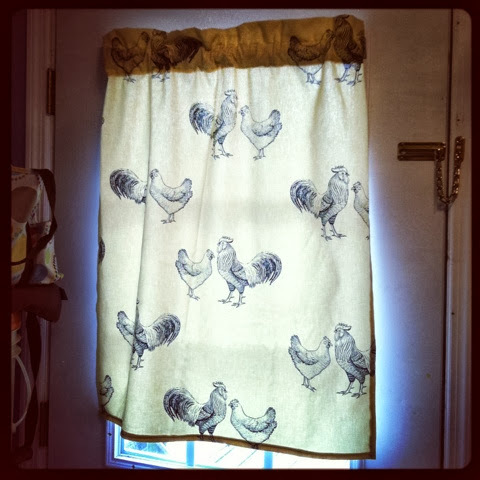 This fabric is a nice woven, somewhat thick fabric, so I knew it would make a nice curtain. 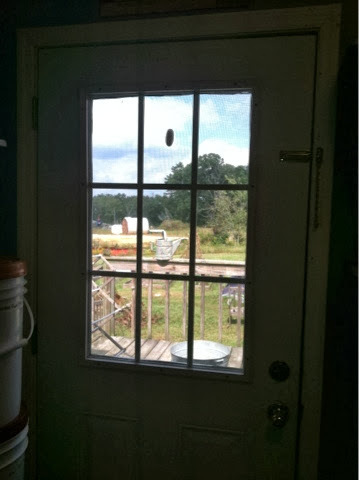 I measured the length of the window and the width. I added a couple of inches to the length and to the sides. Hem around the raw edges. Turn under several inches at the top and sew. Also sew down the middle of the top hem so you have a slight ruffled edge for the top! It was very easy and would be a great beginner project. It really is amazing the difference the shade makes in the room. I love a quick and easy project. It is almost instant gratification. Plus, the only thing it cost was the $1 rod. That to me is a BIG bonus! Don't you just love the satisfaction of making things ourselves? Love it! This fabric would be adorable in the kitchen too. Thank you for sharing!